Storey Publishing, LLC, 9781603424400, 169pp. Take your holiday cookie decorating to impressive new heights! Valerie Peterson and Janice Fryer will have you sprinkling powdered snowflakes onto cheery snowmen and adding a sugary glimmer to multicolored strands of licorice lights. With more than 60 fabulous designs for Christmas cookies, plus festive delights for New Year’s and Hanukkah, Cookie Craft Christmas gives you the inspiration and simple instructions you need for batch after batch of deliciously show-stopping holiday cheer. Valerie Peterson is the co-author of Cookie Craft and Cookie Craft Christmas, and the author of Peterson’s Happy Hour and Peterson’s Holiday Helper. Prior to her full-time writing career, she worked for various publishers including Random House and John Wiley. She lives in Manhattan, New York. 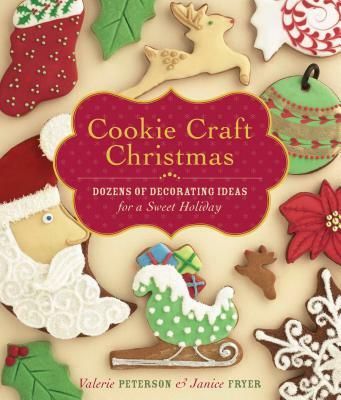 Janice Fryer is co-author of Cookie Craft and Cookie Craft Christmas. She is a Pastry Arts graduate of the Institute of Culinary Education in New York City, and lives in New York.